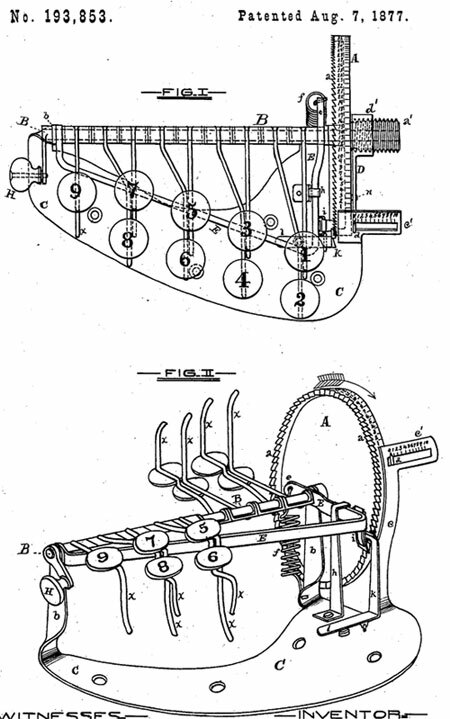 On 7 August, 1877, Marshall Moses Cram (1851-1938) of Mankato, Minnesota, received a U.S. Patent 193853 for an adding machine, similar to the later Centigrpah of Arthur Shattuck. In contrast with Centigrpah however, the device of Cram remained only on paper. Marshall Cram was a holder of three other US patents (for a boiler cleaner (US634521) and for profile measuring and recording devices (US987863 and US1308580)). Let's examine the operation of the device, using the patent drawings (see the lower drawings). The figures on the slotted indicator scale (marked with c') indicate hundreds, and those on the periphery of the wheel just above the indicator are units. The operator works the keys with his right hand, the thumb being used on key No. 9. To add a column of figures, a key corresponding to each figure is pressed down as far as it will go, and allowed to rise again before pressing another. After pressing keys to correspond with all the numbers, the sum is read off from the indicator, as shown by the pointer d, and from the wheel just above the indicator. If another column is to be added, set down the right-hand figure, the others being "to carry"; then, pressing the lever (l), turn back the wheel by means of the crank (H), as far as it will go, when the pointer will be at 0 on the indicator, and 0 0 will show on the flanged ratched wheel (A) with one hundred theeth (a a). Then count first what there was to carry, and proceed with the next column.